What does a Literary Service actually do for you? A Literary Service has the goal to help make sure your ideas are perceived the way you intend. However, they may tweak your story slightly or offer advice they feel is needed. They can make sure your spelling, grammar and punctuation are correct, and they can add a spark or a bang to your summary or your synopsis. Now, if you have a manuscript that needs to be typed up in a word doc you can have a friend or family member type it up for you if you cannot do it yourself. If you hire a professional typist or typing agency to do this it can cost you anywhere between .10 cents and .15 cents per word. Be leery of a typing service who charges by the hour, because everyone types perfect accuracy at a different speed. For those who purchase a Publishing package of Platinum or Titanium, editing the word doc is included. And if you need to have your manuscript typed up, then you can get it done for less than .05 cents per word when added to the Platinum or Titanium Packages. The bottom line is, it is not cheap to pay someone else to handle your manuscript, so doing as much of the leg work yourself, such as typing it on a Word Doc, and having someone you trust read it for grammar structure and punctuation before you try to send it in for publishing is far more cost effective. If you want to publish a high-quality book, whether it is self-published or you are planning to go the old school route of attempting to secure an agent that might land you a contract with one of the large publishing houses, you must have your manuscript professionally edited. Empire Publishing performs two rigorous rounds of editing. The first is mechanical using academic software and then is read from beginning to end by editors who have a BA Degree in English/Literature. 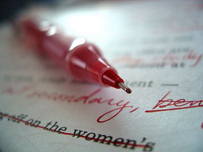 If you need Editing or help getting your manuscript onto a Word Doc then please scroll down. Pay the deposit fee of $195. by using the “Buy It Now” button and send your MS Word manuscript to editor@empire-puiblishing.com or use the author upload form below. If you need to have it typed into a Word Doc., please call 702-292-4638 for further instructions.